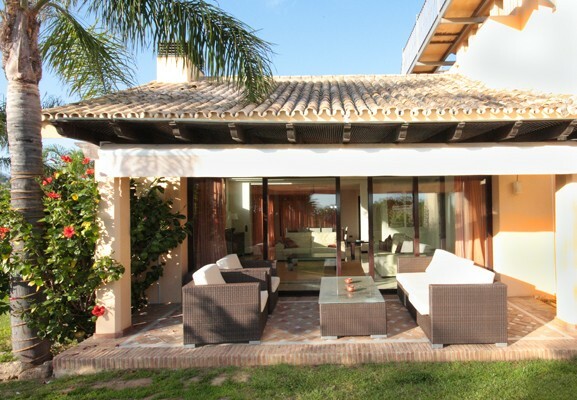 Azure Holidays are proud to present this luxury 6 bed villa in Marbella. When it comes to villas in the Costa del Sol they do not get more exciting than this. With its large private pool, sumptuous bedrooms and fantastic family living this villa can accommodate up to 12 guests in style! Ask Azure. "There are so many superb aspects to this house, set over three levels with room after room of great quality living space, this is a home designed for relaxation and luxury. The villa itself is spacious and inviting and the outside area offers much in the way of family entertainment and excitement. We love the attention to detail - from the spa baths to the BBQ area no expense has been spared to make sure your holiday is the holiday of a lifetime you deserve." One of the many fantastic parts to the outside space at this wonderful holiday property is the pool; inviting and unusual in shape - almost in the shape of a whale, with a shallow end moving through into the deeper section. The dark tiles give a mysterious shade to the water that adds to the excitement of having your own private pool. At the end of the pool looking towards the villa a triangular shaped set of steps covered with foliage draws the eye, this unusual feature of the pool area compliments the triangular features of the villa and adds to the well designed ambiance of the villa. The pool has a fence all around to make sure your little ones are safe and is just one of the features that make this property perfect for a family holiday. One of the other family friendly features is the play area, with a climbing frame, slide and swing and den area. Settled in the corner of the garden under the shelter of the shade of trees this is the ideal spot for your little ones to play out of the heat of the sun. The garden is mature and well tended with palm trees and shrubs placed around the boundaries of the property with so many areas to explore. The outside BBQ area is another space that is perfectly designed for those communal meals that really make a holiday enjoyable. The glass top table and rattan furniture seats up to 12 people and the large built in stone charcoal BBQ offers plenty of opportunity for those budding chefs to try out their grilling skills for the guests! The whole area is covered with a tall beamed roof giving that perfect shelter from the heat of the day and one side of this special area gives access to the incredible view that makes the most of its elevated position in the garden. This is such a relaxing area to be. There are many places to sit and relax and enjoy this outside area, plenty of sun loungers, and another terrace area that is home to comfortable rattan sofas and chairs with a coffee table in the centre. From here you can see through the patio door to the luxury living room inside. The inside of this property is stylish and interior designed to a very high standard. The white walls are bright and the terracotta accents of the rugs, cushions, curtains and artwork are the perfect complement in the room which evokes a relaxing ambience. The living space occupies the large open plan space and one end of the house. The patio doors open from this room out onto the terrace area, and the large windows placed in the triangular wall give so much natural light to the room. The white sofas are placed around a large rug and provide a lovely communal area centred around the fire place and the patio doors. This is a lovely space, perfectly designed for late evening conversation and relaxation. The other side of the living area is the dining area, there is plenty of natural light entering in from the patio doors, providing another great space for enjoy meals together. The kitchen is the other space that is ideal for family life! Large and spacious there is a smaller table and chairs in here ideal for breakfasting or for any children to munch at, or even just a space for people to enjoy being together whilst preparing meals. The kitchen itself is top quality and contains everything that you could possibly need for catering for a large group of people. Three of the stunning bedrooms are on this ground floor, two double bedrooms and one twin room. The bathrooms are decorated to an extremely high standard and the bathrooms are equally gorgeous. All of the bathrooms that have baths have spa baths, which are the ultimate in indulgent relaxation. The master suite occupies the whole of the top floor; the sumptuous super king-size bed is inviting and tranquil offering a space for a great night's sleep or a rejuvenating siesta. The room has a wonderful terrace area that you may find the whole family wanting to explore and relax on. The en suite bathroom is on equal footing with the rest of the house in terms of top quality and luxurious fixtures and fittings. Down to the basement and you will find a further twin bedroom with en suite bathroom, and whilst there are no windows in this room, no luxury has been spared for this fantastic extra space. There is also a games room, with a large wall mounted flat screen TV, with Sky channels and games console, ideal for those that want to curl up and enjoy a movie or battle it out on a computer game without disturbing the rest of the house. There is a table tennis table for your entertainment too. The house also has a large garage with enough parking for four cars, ideal for large group bookings. The final bedroom is in a wonderful annexe at the end of the garden. This self contained apartment which sleeps two people has an en suite shower room and is ideal for nannies and grannies alike! We cannot recommend this villa highly enough, with all of its top quality design and features, staying here is a virtual guarantee of the best holiday experience you will ever have. The great El Rosario location of this villa is another of its top selling points. Within walking distance of the beach you will have plenty of opportunities to enjoy the Sun Sea and sand of the Marbella coast as much as you like. There are plenty of restaurants and bars within a short walking distance as well as a supermarket for all those essentials. This is an ideal sporting destination, as the villa is only over the road from the Los Granados tennis club. Not to mention the many golf clubs that surrounds the area for you to practice your game in the warm Spanish sun. The closest one is the Marbella golf and country club, a very short walk away. There are local activities such as horse riding, mountain biking and the fun water sports that make the most of the weather and water here. You can read more about Marbella in our guide here. If you have any questions or would like to book this stunning property, please feel free to get in touch with us via email, the form below or call us on the number above. We are looking forward to helping you choose your ideal holiday home.